You can sign up to be a member all year round!! Join us for our last General Meeting of the school year on Wednesday, May 8th, 2019 at 6:15 pm. We will have light snacks and refreshments. Come and stay informed about school activities and find out what we are planning for the year end events! Coming to the meeting does NOT mean you are going to volunteer, it’s so you have a say in what goes on at your child’s school, plus meet some great people and have some fun in the process. Boys can bring Mom or other Special Guest. Join us for a night of dancing and photobooth fun on Friday, April 26th from 6-8PM! Wear Neon or White so we can Light up the Night!!! 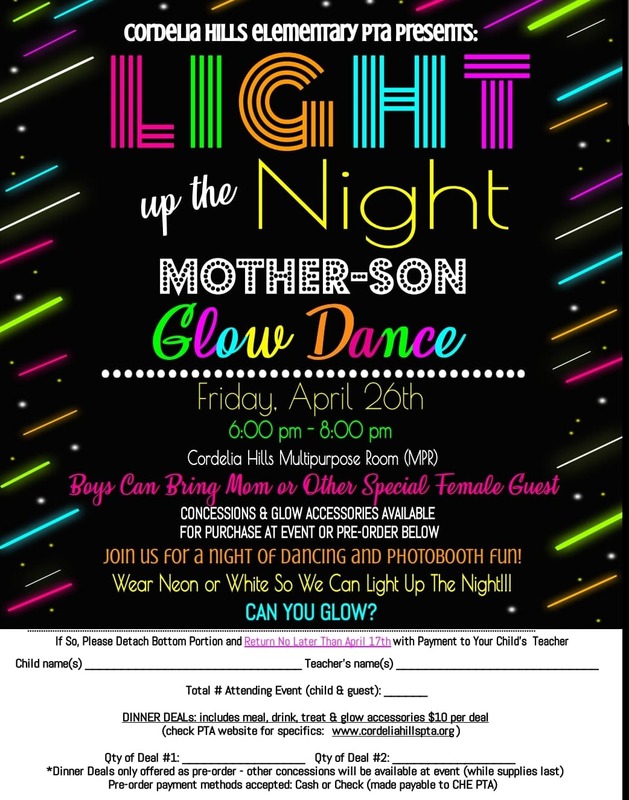 Concessions & glow accessories will be available for purchase at the event. Pre-order deal #1: Slice of cheese pizza, a cookie and a drink, plus a glow accessory. Pre-order deal #2: Slice of pepperoni pizza, a cookie and a drink, plus a glow accessory.